Mix the first 7 ingredients and form ball of about 1 inch. Cook them over the olive oil in a pan, turning them. Make couscous according to package direction. Once the meatballs are cooked, pour over the tomato sauce to heat it up. Salt and pepper to taste. 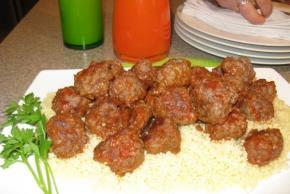 Pour the meatballs and the sauce over the cooked couscous to present.